Combine vinegar, olive oil, Italian seasoning and ½ tsp. kosher salt in a medium mixing bowl and whisk well. Place eggplant slices in a large re-sealable bag and add the marinade. Seal the bag, removing as much excess air as possible, then refrigerate the eggplant slices for at least 1 hour. As the eggplant marinates, combine basil, Parmesan, olive oil, garlic, and pine nuts in a food processor or blender and blend until smooth. Add salt and pepper to taste. Refrigerate the pesto until ready to use. Fire up a full chimney of Original Kingsford® Charcoal. Adjust the bottom grill vents for medium-high heat cooking, approximately 400–425°F. Remove eggplant slices from the marinade and pat dry. Place eggplant on the grill and cook for 3–4 minutes per side until soft and lightly browned. Remove from the grill and set aside. Cut the Italian bread horizontally then place on the grill cut side down for approximately 2 minutes until lightly toasted. Remove the bread from the grill and place the bottoms on a metal sheet pan. 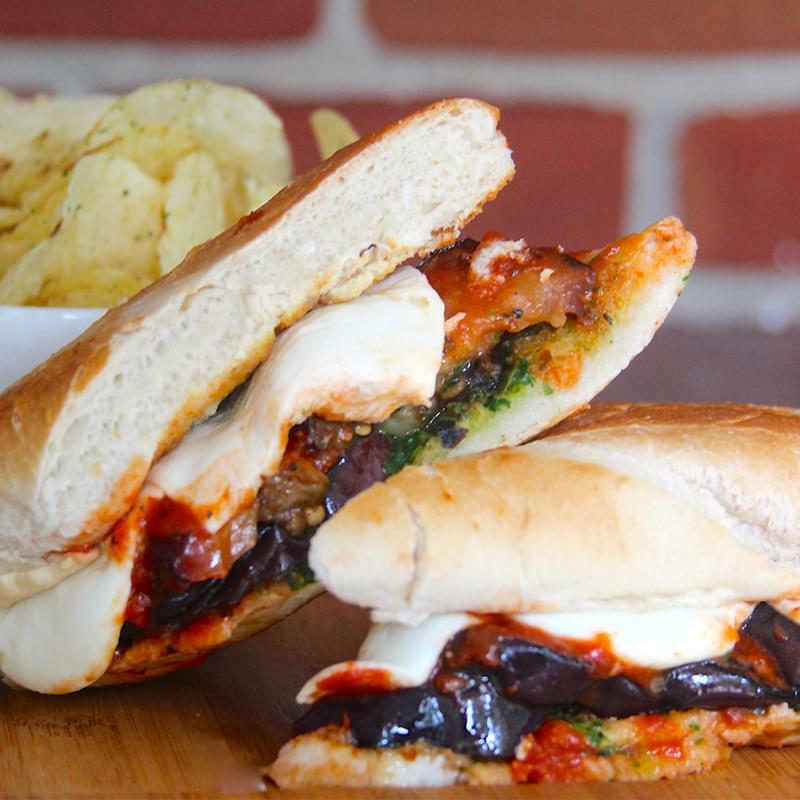 Spread pesto on the Italian bread bottoms, top each with 4–5 slices of grilled eggplant, 2 tbsp. tomato sauce, and a layer of mozzarella. Place the sheet pan on the grill, cover the grill, and allow the sandwiches to heat for 4–5 minutes until the cheese has begun to melt. Remove from the grill, place the tops on the sandwiches, and serve immediately.